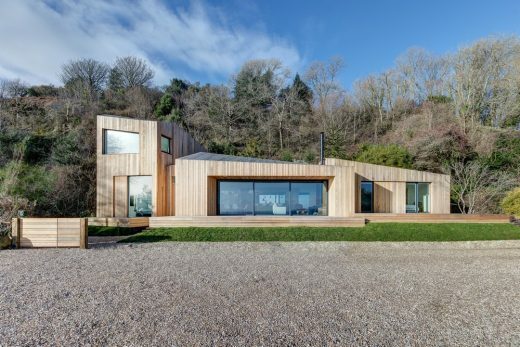 Five buildings in the South East won RIBA South East Awards from the Royal Institute of British Architects. 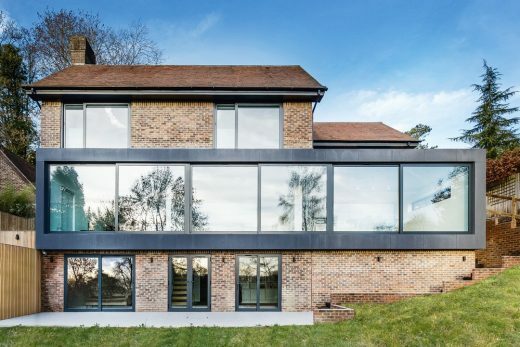 Black House is a private new build house in Kent, completed in the summer of 2017 by Winchesterbased architects AR Design Studio. 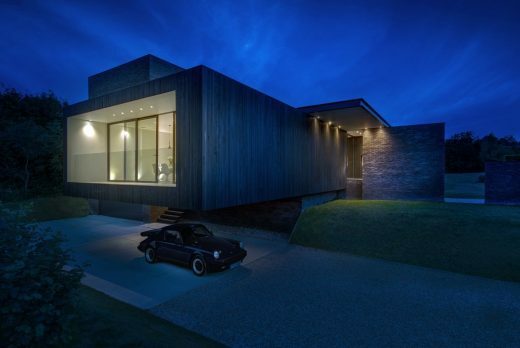 A contemporary property, Black House draws its influences from both the historic and modern buildings of Kent. 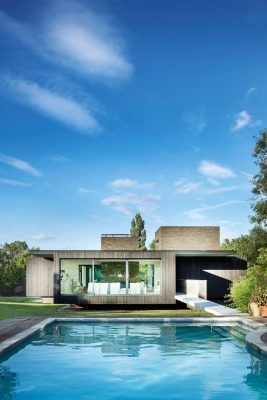 A retired engineer and Conran interior designer, the clients, chose to move from a 15th century Tudor house and build a contemporary dream home in their garden. 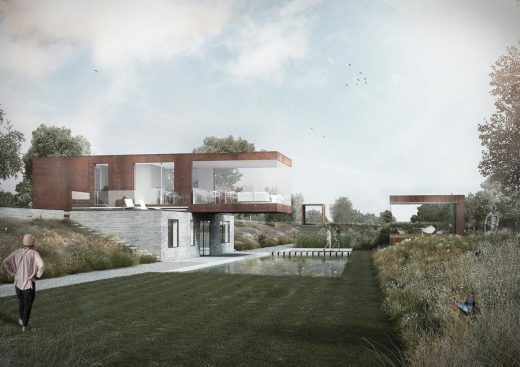 The buildings concept was formed after the design team and clients embarked on an architectural tour in Kent, in search of inspiration from the land and local context. 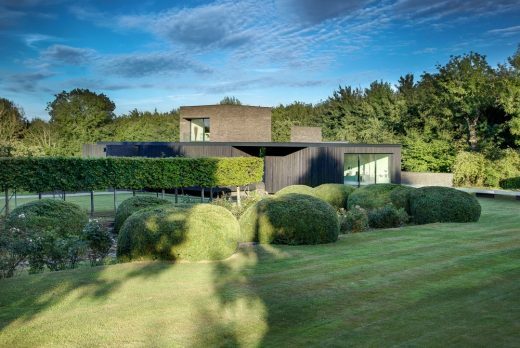 The floating form and massing of Black House was inspired by Sissinghurst Castle Garden, home of writer Vita Sackville-West. The castle gardens are broken into a series of individual experiences hidden from each other by manicured hedges and weathered red brick walls. Only from the writing room in the central tower can the connection of the spaces and whole design be seen. 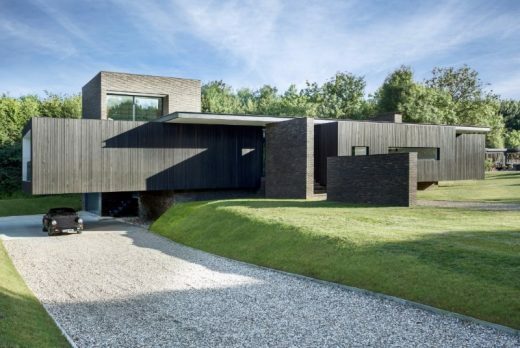 The Black House rectangular massing was divided into blocks by key site axes, a view from the pool to a large populus tree, and a previous path to the site. 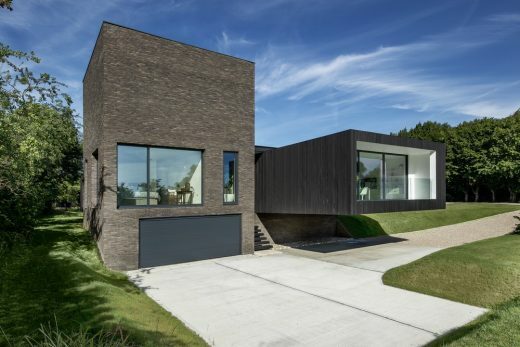 Each block is linked to a distinct aspect of the garden, with a final connecting view provided from the roof of a brick tower. 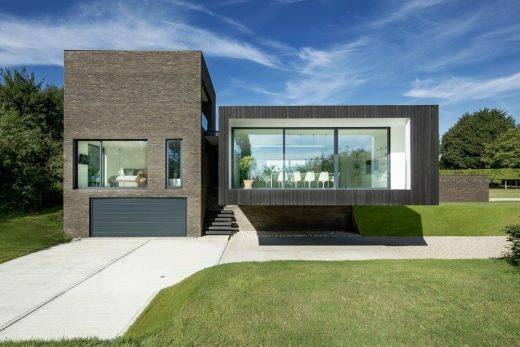 The volumes were separated to create a central courtyard, with a cantilevering roof to tie the modules together. 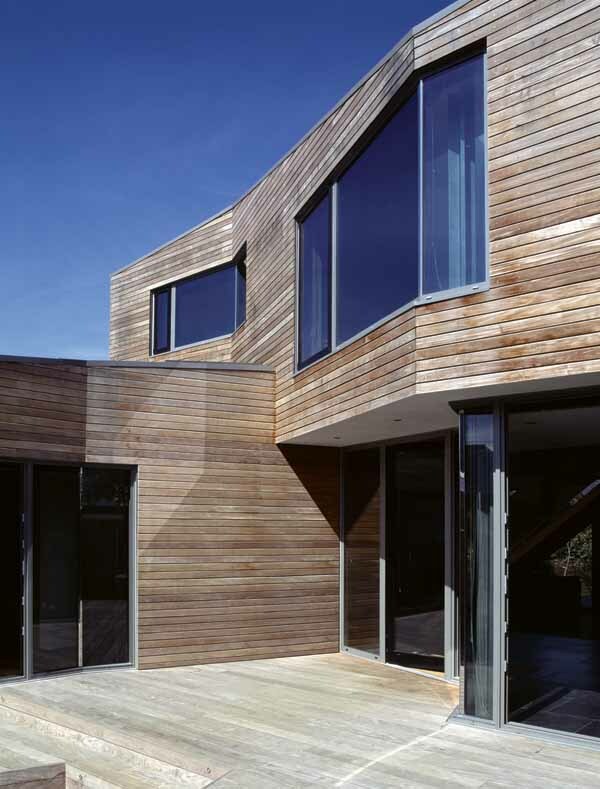 The design team also viewed Hasting’s historic net huts and the traditional black clad houses of Dungeness. 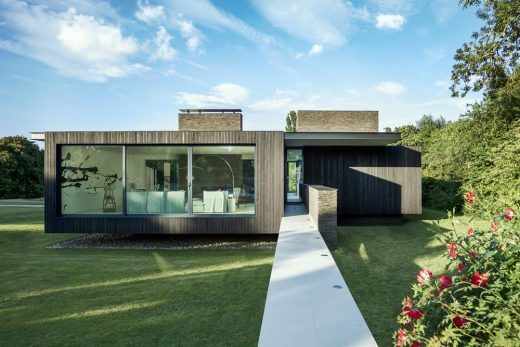 As a response a vertical black timber cladding is used throughout. Visiting the interlocking volumes of the Turner Contemporary Gallery (photo above), in Margate, by David Chipperfield Architects, informed the studio how to interconnect the low massing of the black timber boxes and the brick tower. With each block linking to a different part of the garden, a journey around the functions of the house is experienced. The journey begins with one of the three entrances, designed along the axes of the building. 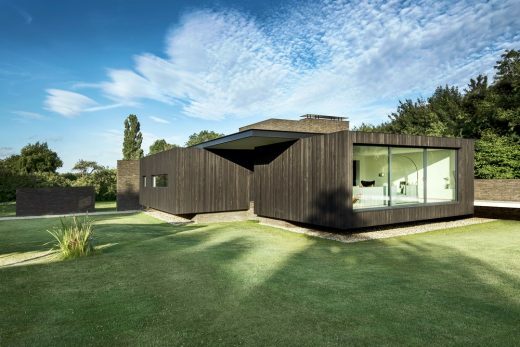 The kitchen diner is a 7.3m cantilevering room facing east to capture the morning sun. With floor-to-ceiling sliding glass doors, the orientation provides expansive views across the orchard and vineyard. 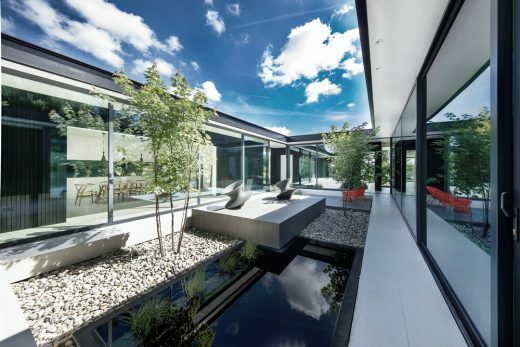 The drawing room fronts the pool area to the west, two spaces linked to accommodate rest and play. A panoramic horizontal window influenced by Margate frames the view from the formal dining room across the formal front lawn. The final aspect is the bedrooms, they are provided privacy and seclusion by the proximity of the woodland to rear of the house. 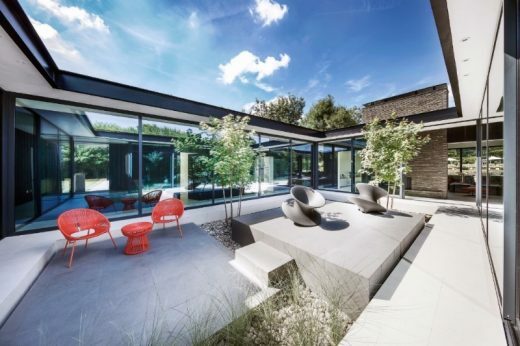 These spaces are all connected by the central courtyard, an area of extensive glazing allowing light and fresh air to continually penetrate the house, and provide year round sheltered outdoor space. 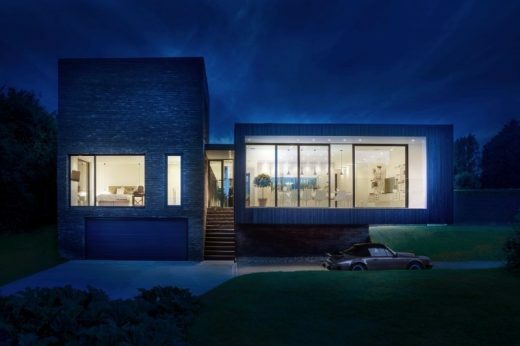 Having constructed the house, the clients have chosen contemporary living over historical, a building designed for them, to suit the way they want to live today. 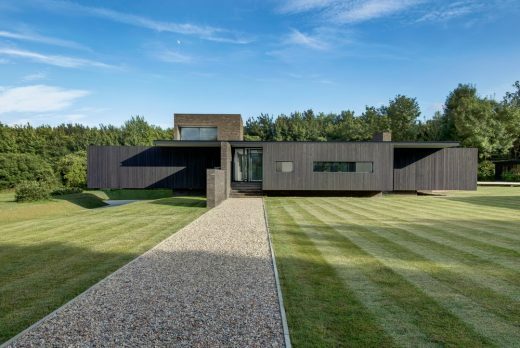 The result is Black House, a sequence of dramatic experiences linked to their garden, and is a contemporary response to the region.